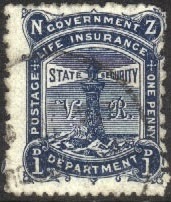 The New Zealand Government Life Insurance Department was opened in 1869 and started issuing its own stamps in 1891. 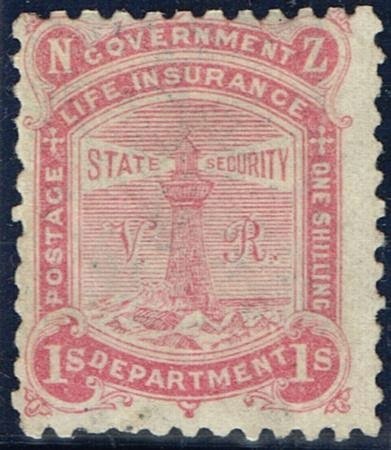 Up until that time The Insurance Office, in common with other Government services, had enjoyed franking privileges, paying an annual amount to the Post and Telegraph Department to cover the cost of postage on its correspondence. 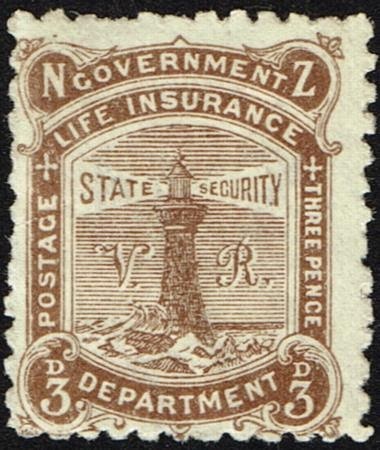 The decision to issue the stamps was the result of a dispute between the two Departments regarding the calculation of postage costs. 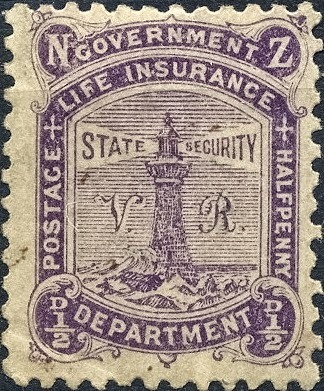 The matter was referred to an arbitrator but the Insurance Department insisted on paying future postage costs by the purchase of postage stamps. To ensure that these stamps were only used for their intended purpose, they had to have a very distinctive design. 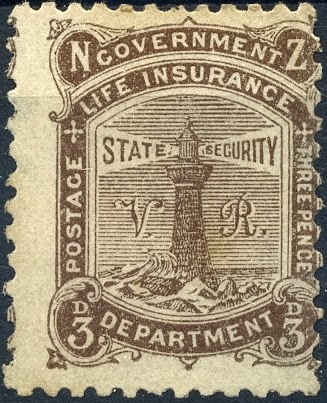 Since the symbol of the Insurance Department was a lighthouse, all Government Life Insurance Department stamp designs have featured lighthouses. 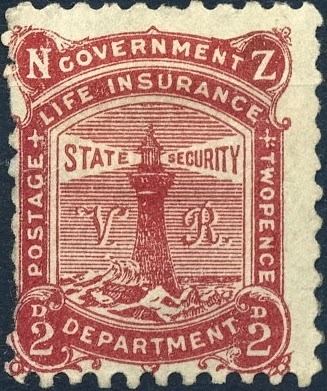 In the rays of the lighthouse are the words "State Security" and the letters "V R" are shown in the background, behind the lighthouse. 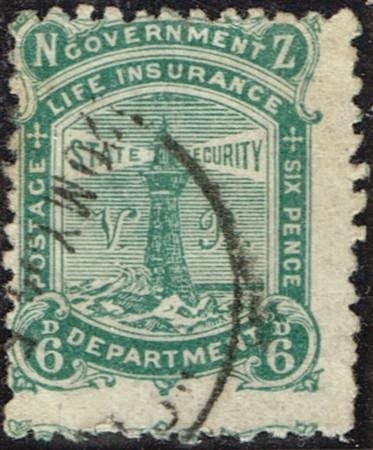 So actually this was more like a personalised stamp, being issued by the Post Office but only used by the Insurance Office. 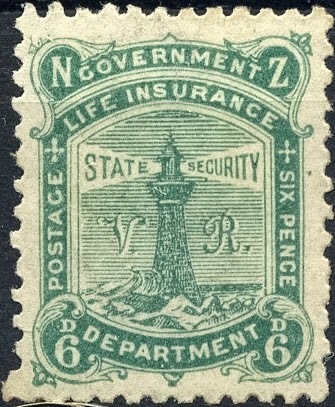 The stamps were designed by WB Hudson (Life Insurance Department) and J F Rogers (Government Printing Office) and engraved by A E Cousins. The plates were then made at the Government Printing Office. The following values were issued: ½d, 1d, 2d, 3d, 6d and 1/- (1s). 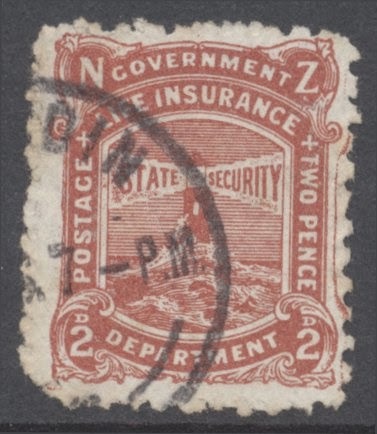 The first issue was perf 12 x 11½ and was issued on rather poor quality paper in which the watermark has a 4mm gap between the NZ and star. 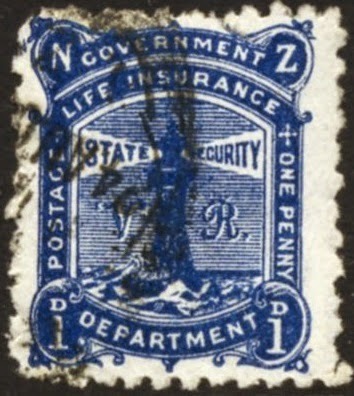 This paper was also used for the Second Side-face Issue and often collectors referrer to it as the insurance paper. You will notice the poor quality of these stamps below with faults like colour variance, poorly centred stamps and ragged perforations. There was only one printing of the 3d, 6d and 1/- values, but several printings of the other values on paper with 7mm between the NZ and star and perforated 10, 11 and 11 x 10. 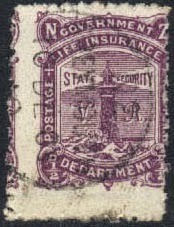 In 1902-1903 they appeared on a paper with watermark sideways and perf 11.
and part of next stamp on the left side. resulted in this much darker colour. 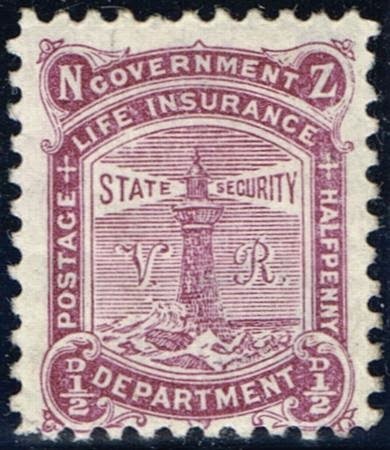 Life Insurance Stamps Without the VR. 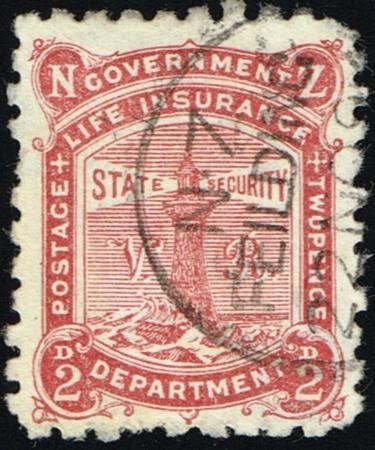 2d Chestnut (1905). 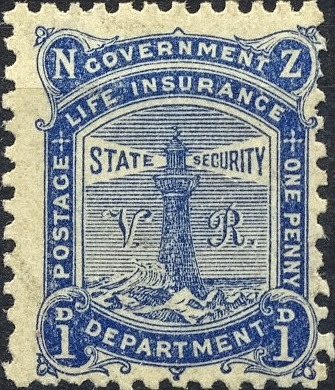 1d Blue (1906). In 1905 (2d) and 1906 (1d), new plates were produced in which the VR was omitted since Queen Victoria had died in 1901 and her son was now King. The watermark is sideways and the perforation is 14. 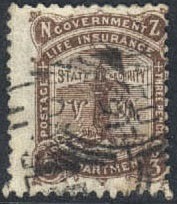 I will cover these two stamps again in my next post because since they appeared without the 'VR' they are usually included as part of the 1913 series. 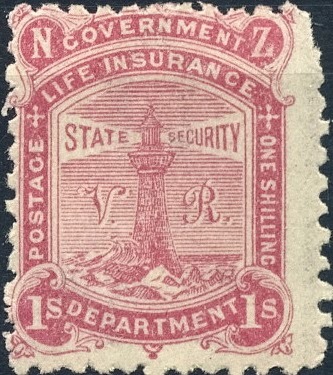 The stamps were withdrawn in January 1907 and like other Government Departments, the Insurance office began using ordinary postage stamps overprinted with the word 'Official'. 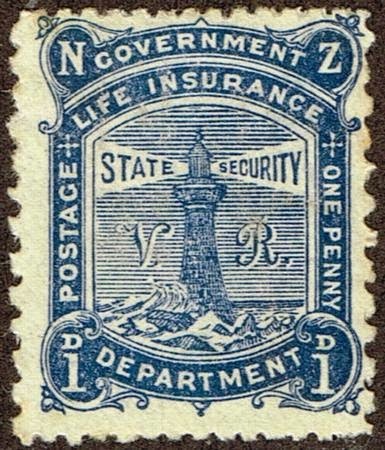 Later in 1913, further problems between the two departments caused the New Zealand Government Life Insurance Department to begin issuing their own stamps again. Government Life Insurance - Summary. Interesting post. I like the images you have Mary. They are clear and sharp. I am also surprised that you compared these stamps to modern personalised stamps. I would not have thought of that but it does describe them well. You guys really get into these funny old stamps don't you. 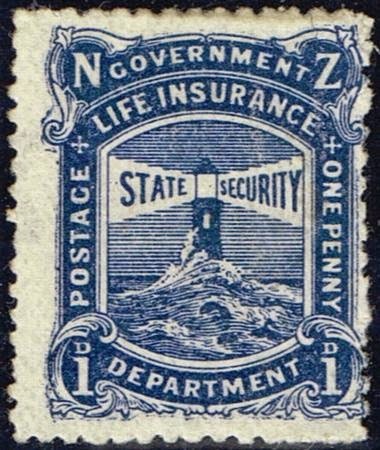 This post meant more when I saw your second post on these old lighthouse stamps. Funny old stamps! Scruffy and dirty! You are sailing close to the wind young lady. Kirsten, go and have a look at other posts on early stamps and you will see they are works of art. Each design being hand engraved line by line. Its amazing when you think about it, how much work has gone into a single stamp design. That is one reason why people are attracted to these early issues. 2015 - 175th Anniversary Treaty of Waitangi. The Millennium Series - The Complete Series.